Maintaining glowing beautiful skin on your own schedule is easier than you may think and less costly than an esthetician as well as more practical and convenient than traditional micro-dermabrasion. The PMD personal microderm system is a professional quality micro-dermabrasion device that can be used in the privacy of your own home. Easy to use, the PMD personal microderm system exfoliates the skin and minimizes pores while rejuvenating the skin using aluminum oxide crystals helping you look younger over time with use. The PMD system provides micro-dermabrasion to the face as well as the rest of the body for all over beautiful exfoliated skin. Micro-dermabrasion provides mild skin resurfacing and exfoliation by removing the top layer of skin so that new healthy skin may be revealed. The PMD system can be used to treat a plethora of skin conditions such as acne, blemishes, wrinkles, scars, burns, uneven skin tone, and fine lines. In addition to providing friction it also provides suction that aids in clearing clogged pores and giving you a clearer more beautiful complexion. This system provides three different levels of exfoliation by way of attachment disks that go on the end of the device with smaller ones for use on the face and larger disk attachments for use on the body and for use with different skin types. Beginners should always start with the more mild treatments and work their way up to more abrasive settings if deemed necessary by skin type. Make sure to always use the PMD personal system on freshly cleaned dry skin. You should always wait at least a week between treatments in order to give the skin time to heal. Varying skin types will react differently to treatments so make sure to test on a small area first that is not on the face. It is also important to use sunscreen during any sun exposure before and between treatments. Anyone who has spent countless dollars on clinical micro-dermabrasion treatments will delight in the savings they will experience purchasing the PMD personal microderm system. Make sure when using this system to watch the instructional videos and follow the directions for optimum results. Users of this system will also delight in the fact that they won't have to skip appointments because of their busy schedules and will be able to keep their skin's youthful glow easily and conveniently. Be ready to see the results that will boost your confidence and overall appearance when using the PMD system. 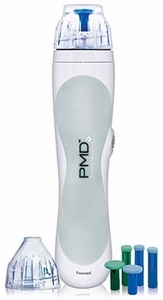 For a closer look at the PMD microderm system, and other PMD products, click here. Skincare Solutions Store has a amazing selection of quality skincare products that will help your skin stay young and healthy looking.